The key macro battle that will impact all investors and asset allocators is between the view that unemployment is currently still a cyclical problem versus the impression that there is a structural issue that is currently affecting labor market. Now, there is a strong case for each and there are clear signs that there are structural problems but where you place more emphasis between these two views will make a huge difference in your portfolio construction. I will not go through all of the evidence and arguments but focus on the general portfolio implications. If you believe that current unemployment is still a cyclical problem, then you will also believe that monetary and fiscal policy can be used to push unemployment down. Keeping rates low will not be inflationary since there is still slack in the labor market. In fact, you would want or accept longer and stronger policy action to break through the output gap that still currently exists. Under this view, you will not worry about inflation or the potential for tight labor markets that will force wages up in the near-term. You would construct your portfolio under the view that monetary policy by the Fed will continue and there will not adverse harm to bond markets or equity markets. The structural view is that much further increases in employment may be limited. There are structural reasons for the lower participation rate and the long-term unemployment. The Fed is pushing on a string and labor markets may be tighter for those who have skills needed by the market. Wage rates can move higher because there is a growing labor tightness. The Fed will be slow to react and there will be higher inflation. The Fed will be late to any policy change. Wage increases could reduce profits and lead to higher inflation. Call it a cyclist versus structuralist fight. Chairman Yellen seems to be biased to the cycle arguments and this should raise alarm bells with structuralists. If I ask you your view on this issue, I should see a portfolio that has the same appropriate view. The underlying assumptions you have about the economy is extremely critical at this time. Just looking at the data is not enough. What are money flows telling us? 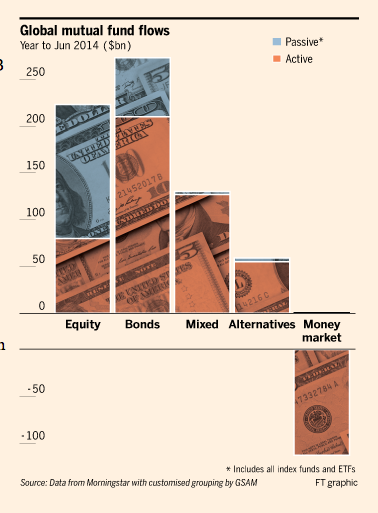 A recent FT article focuses on global mutual fund flows. It caught me by surprise to see the significant flows into bonds. This was supposed to be the ongoing period of the Great Rotation. The flows do not show a rotation but just a grab for yield and this is the problem for the economy. This grab for yield creates the credit bubble we are currently seeing. Central banks want the movement into risk assets to boost the economy, but not just a switch to yield out the curve. The flows to passive equity could be investors just being wise the poor performance of active management but it is also another indication that there is a grab for risky assets and yield. The following quotes are useful for any researcher even financial modelers. There are no foolish question and no man becomes a fool until he has stopped asking questions. We are trying to prove ourselves wrong as quickly as possible, because only in that way can we make progress. Far better an approximate answer to the right question, which is often vague than an exact answer to the wrong question, which can always be made precise. Understanding of history is critical for traders - to appreciate what will be repeated and what is unique. History is the science of things which are never repeated. It is always a mistake for the historian to try to predict the future. Life, unlike science, is simply too full of surprises. Something to remember when discussing policy. All of what is interesting happens when it storms. Economics is a discipline for quiet times. The profession, it turns out,... has no grip on understanding how the abnormal grows out of the normal and what happens next, its practitioners are like weather forecasters who don't understand storms. I have a bias and it is with the use quantitative investing strategies. I like the idea that there is no commentary such as "I feel the market is going higher". I like the idea that back-tests can be done for any model and there is clear way to measure the success of a model. However, quant modeling has its own set of biases for which special care should be taken. Here are three. Similar comments in the context of numbers based models have been made by Aswath Damodaran, the NYU professor, in his blog. The illusion of precision - There is a precision with using a model and focusing on the numbers but as anyone who has worked with numbers knows, there is error with any model and with the inputs used for a model. Economic data is subject to revisions. Good models of risk premia can only explain a small portion of the variation in the data. There is a lot of imprecision with models and it takes skill to appreciate and understand those limits. The illusion of objectivity - Some will say that you just look at the cold hard facts, but no model is truly objectivity. 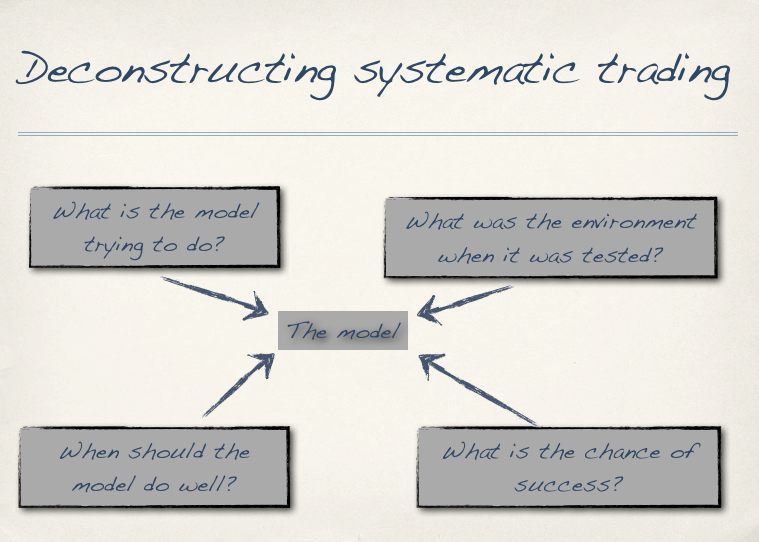 A model incorporates the biases of the model-builder. This cannot be helped. Every choice made by the model-builder includes his view on how markets operate. The illusion of control - Markets change. There are structural adjustments and changes in the sensitivity between the market and variable inputs. Models are inherently backward-looking so they are never in control of the future. Quantitative modeling may avoid some behavioral biases, but that does not mean they are without there own set of biases. If you want to read one book on the indictment of current policies and the risks with the current monetary experiment called quantitative easing, this is the one to read. The current monetary environment is very complex with a significant number of assumptions which drive policy choices. It is not clear whether those assumptions are correct or the expected outcomes will be reach. 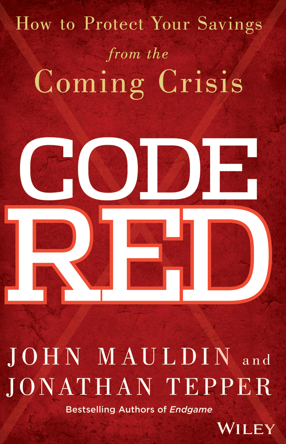 Mauldin and Tepper provide a very readable work that makes these complex choices approachable. The global economy has been able to pull itself from a potential disaster through active and strong monetary stimulus from central banks, but the impact of this continued stimulus is still unclear. Inflation has not been really seen in the post crisis period, but the potential for higher inflation, currency wars, and continued balance sheet problems still exist. Central banks have done a good job of actually having people accept that printing money to increase inflation, inflate asset prices, and debase the currency is all good for us. Debt is good and savings is bad under current central bank thinking. Since every country cannot follow the same policy of devaluation, the world will face currency wars coupled with higher global inflation. Continued deficit financing will only lead to a world of financial repression by governments in an effort to reduce the cost of the excessive borrowing. Our economists are unlikely to forecast the events that will lead to a financial breakdown. Inflection points have never been a strong of this profession. The use of excessive money will lead to trend behavior and bubbles in assets markets as investors follow the herd based on cheap credit and euphoria that will be unrealized. The authors do a good job of explaining what our future may look like and it is not a pretty picture. Financial safety will be in short supply. 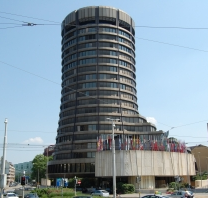 Anyone who reads the annual reports of the Bank of International Settlements (BIS) will always be impressed by the quality of its research and analysis, yet if you ask most who have read these reports what does the BIS actually do, you will not get a very clear answer. It is the bank to central banks, but what does that mean? Cannot central barks work with each other or through other world organizations like the IMF or the World Bank? The answer is that since the early post WWI period, the BIS has played an important role in moving central bank capital and facilitating transactions for central banks. The BIS has always taken the view that their job is to help with these transaction without any consideration of the greater global or ethical considerations. The ethical ethos is that the bank will follow the rules of facilitating the needs of their client institutions even when it has been for the benefit of what most would consider illegitimate regimes like Nazi Germany. It has worked in the shadows and without much oversight. Run by technocrats for the benefit of other banking technocrats. 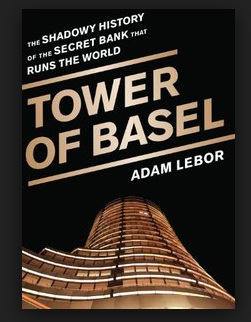 Adam Lebor provides a fascinating history of the bank. Something which many would like to whitewash. The questions is whether the sins of past should affect our views of the present. It is hard to say, but the more pressing issue is whether in the current global environment we should have institutions that do not have accountability to some higher government authority. Is global finance too important to be left to democratic governments or should the general populous through their elected officials controls these institutions? Market discipline has to be imposed even on central banks, but by whom and for whom? The answers are often vague and unclear, but the questions should always be precise and laser-like. 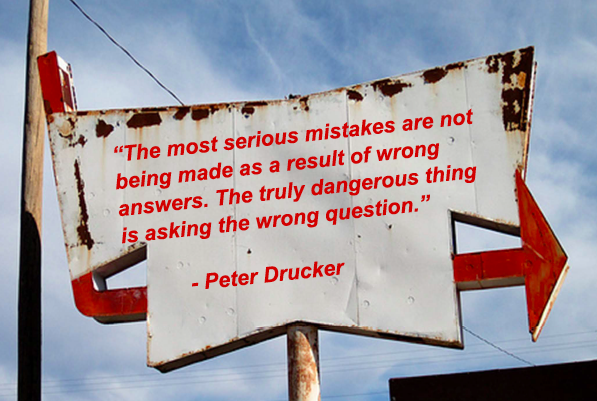 And, if you do not get a good clear answer, ask another precise question until the issue is exhausted. 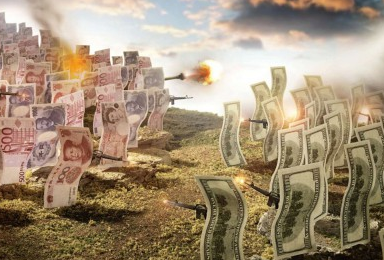 Heading for a currency war with China? 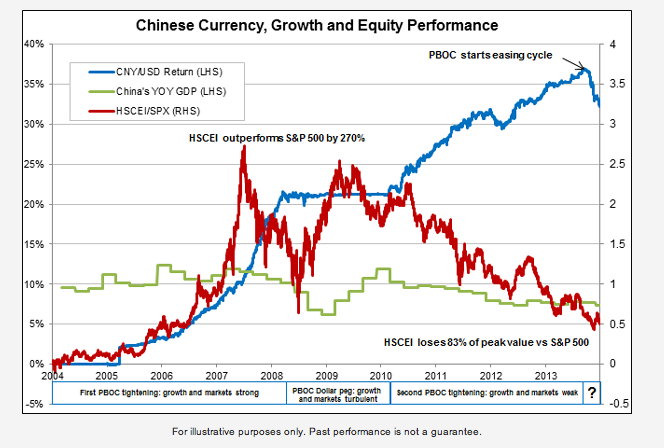 Very insightful chart on the performance of the Chinese currency, stock market, and GDP. The currency has been on an upward trend for years with a rest periodwhen it was fixed to the dollar during the post financial crisis timeframe. So how did that exchange policy work out for the Chinese markets and economy. GDP has started a slow down trend. This slowdown has been expected given past hsitory of emerging markets. We have seen a decline in exports and a significant decline in the trade surplus. More interesting has been the significant decline in the stock market especially in the export driven companies. The clear inference for many policy makers is that RMB strengthening may have hurt the financial and real markets. This hypothesis is hard to untangle but has some truth. Now we are seeing a slight change in RMB direction. This does not just happen without the support of the government. More expansionary monetary policy and a desire to perhaps use the currency as a tool to help jump start the economy or at least keep it at current levels is the likely policy tilt. Financial and capital control liberalization will take a backseat in the short run. A lower renminbi is the desired tilt of China. Isn't this what the Fed wants and the ECB, and the BOJ? Everybody cannot have what they want. Let the currency games begin. 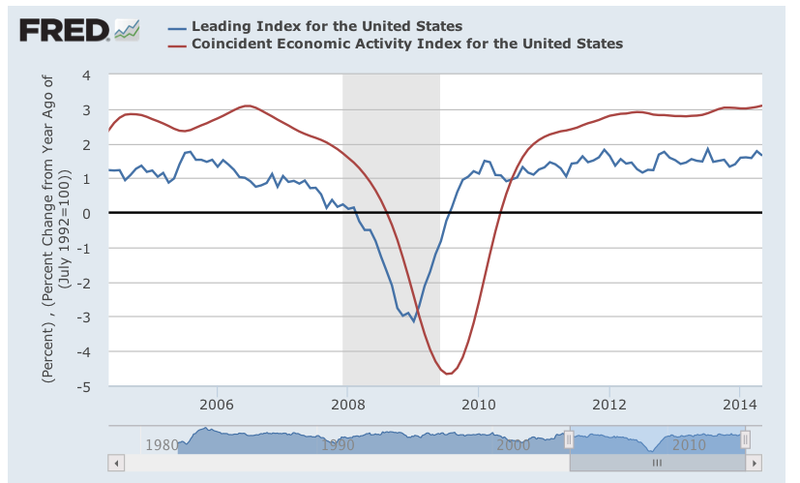 Anything going on with leading and coincident indicators? We had a negative first quarter growth in GDP and there has been no movement in the leading or coincident indicators from the Conference Board. In fact, they have not moved much over the last few years. A question is whether these indicators are still relevant. If you look at some of the components of the leading indicators like money supply, stock market, and terms spreads, you could argue that they are all manipulated by the government. For all of the uncertainty in the markets, it is not showing up in these indicators. This is a chart from last year, but a quick review suggests that nothing has changed. 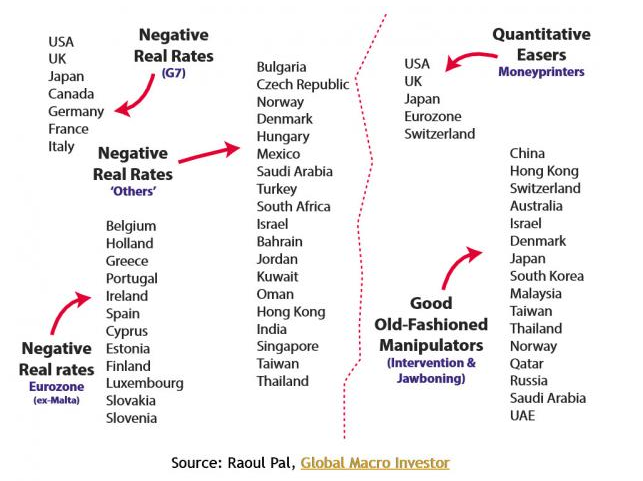 We have 38 countries that have negative real rates of interest, excessive quantitative easing, and currency manipulation. No wonder traders cannot get good signals on the direction of markets. Systematic traders have used prices instead of revised economic data to measure cross market relationships. How are you supposed to do that if you have all of this market manipulation. Came across this quip on currency markets which seems to still apply in the current foreign exchange markets. The currency question is still front and center with a number of countries trying to reduce the supremacy of the dollar and use currencies as means to enhance trade. Last week saw a story on the CEO of Airbus asking for the ECB to do something about the crazy values of the euro, which means that it is too high. Clearly exporters want a lower euro. They want the ECB to push the currency depreciation button and fast. We have the French upset with the fine on BNP for close to $9 billion dollars. BNP does not have the moral high ground, but the US jurisdiction is based on the fact that the money flows with sanctioned countries was in dollars. The US has used the dollar payment systems for political means for one of the first times in decades against one of our major allies. The French are again voicing their concern over dollar hegemony. They will not let go of this issues especially when their economy is in the tank. They want to see the further ascent of the euro as a major reserve currency. Of course, this is at odds with what Airbus wants. 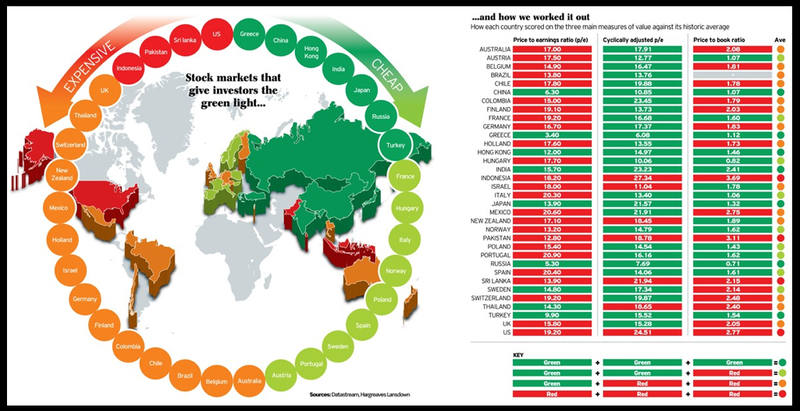 No matter, these are the currency markets where anything goes in terms of opinions. The BRICS countries will launch a development bank which may be hosted in Shanghai which will try and take more power away from a dollar centric world. This will be announced at the BRICS summit in Brazil later this month. It will compete against the World Bank and the Asian development bank. 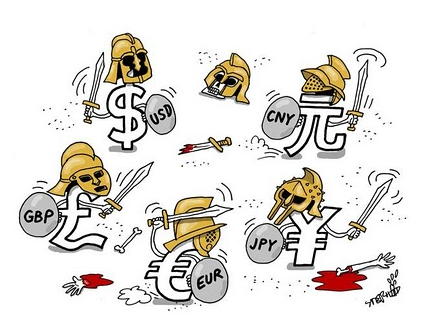 Here is the emerging market form of currency wars. They want their trade to no longer be denominated in dollars and be at the mercy of the Fed. China wants to further speed up the liberalization of its currency and to use the RMB as a means of payment for its trade flows. Russia is in talks to make trade payments with China in renminbi. Some say that over 15% of China trade flows are being done in RMB. The world is slowing trying to get out of the dollar money habit. The cost to the US will be significant but not noticed until it may be too late. There is not tipping point today, but it is coming. The latest BIS annual report has hit the presses and it is a sobering read. It is also refreshingly different from other central bank reports which talk about the success of quantitative easing and the fact that inflation is good for all. There is little comment about periods of strong growth with deflation. The current core reasoning or orthodoxy of central bankers is simple. The global economy, especially the G& need more debt to stem the pain of adjustment from a balance sheet recession. The developed economies have too much debt, but they cannot very well adjust to the pain in this credit cycle so central bankers will have governments issue more debt and and central banks will monetize. The central banks can solve the debt problem by a controlled increase in inflation. Yes, QE may not be working as well as expected, but it would have been a lot of worse if central banks did something else. The global economy need central bankers to save the world through creating inflation that can be controlled and cutting any deflationary expecations. Of course, central banks have not been able to control inflation at keys times in the past, but this time will be different. The BIS in its report pulls no punches as it argues that the global economy is not in good shape. There has been improvements since the dark days of the financial crisis, but the recovery has been poor and driven by unsustainable policies of creating more debt and money. Central banks have still come to grips with the implications of a balance sheet recession. This requires structural reform not more money. The BIS starts with a simple observation. There is a difference between the business cycle and the financial cycle. The financial cycle will last longer, anywhere from 10-20 years. The financial cycle is usually caused by low interest rates which leads to excessive credit. This excess of credit will be extended to those who cannot manage it effectively and will ultimately lead to balance sheets that will need repair. This process of repair will be long and slow. Fiscal policy can try to improve the environment, but it uses more credit as a tool. The repair and delevering in the private sector is just shifted to more leverage in the public sector. Central banks will try to slow the process of balance sheet repair becasue it will cur aggregate demand, but again it will do it through providing more credit through the creation of money. The BIS has been accused of housing "Austrian" economists who believe in liquidation and creative destruction after a periods of excess. Who would have thought they central bankers would shame other with such name calling. The BIS does believe in the broad concept of a Wicksellian natural rate of interest whereby the real rate of interest should be equal to the real growth rate in the economy. If the rate of interest is held below its natural rate, there will be excess credit and financial markets will be out of equilibrium. Monetary policy which keeps real rates too low will have to deal with an expansionary credit cycle which will have lead to speculative and banking excesses. This will eventually lead to balance sheet repairs and a cut in credit. If the BIS was reviewing central bankers as doctors of a sick economic patient, they would accuse the lot of them of malpractice. An unusual assessment from the central bankers' banker. The Daily Telegraph has a nice descriptive chart of what is rich and cheap around the world. The ranking is based a three simple criteria: the price to earnings (P/E), Shiller cyclically adjusted price to equity (CAPE), the price to book (P/B). The color coding is based on the current values relative to historical numbers. The three set of numbers suggest that investors should stay out of the US and move to other parts of the world especially Europe, China, and India. 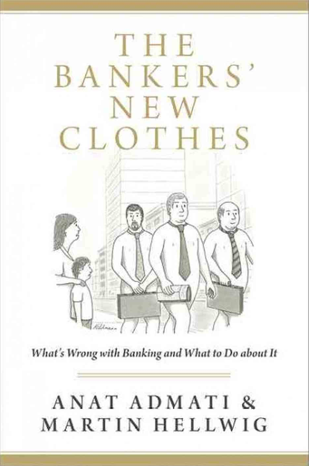 I happened to read this book right after The Bankers' New Clothes. Bove is no friend of the current role of regulation and he believes that focusing on equity may be no simple cure because of the difficulty of measuring the risk of assets. This is not a academic book, but the work of bank analyst. 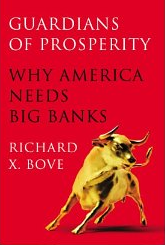 What he presents is a microeconomic perspective of someone who know the nuts and bolts of banks and what the impact of more regulation will have on the credit system, He argues persuasively that banking regulation generated the unintended consequences of a fragile system that created the financial crisis. The new regulation on the post-crisis period will have the unintended consequence of destroying small banks, make lending more expensive, and restrict credit to those who need it most.The current regulation will only increase the size of the large banks, through making snall banks less proftiable even though the stated policy is that we want to move away from the systemic risk of too big to fail banks. We did not need more regulation. We needed to enforce the existing regulation, and in some cases drop the regulation. He is no fan of big banks but emasculating our biggest banks to score points with voters does not make sense. Bank regulators, politicians, and the large barks have failed us. This is the same message as the Bankers' New Clothes, but the solution is different. The "New Clothes" approach is increasing equity. The Bove approach gets into the mechanics of the rules that need to be overhauled if you want a chance to have equity work effectively. What is it about bankers' clothes? Admati and Hellwig provide a simple; nevertheless, insightful book on banks and banking problems. Banks do not have clothes different from other firms. They should not be treated as special. Rather they should be put to the test of any corporation that has to look at financing options between equity and debt. Can they give a good return on equity relative to the risks taken. Too much debt and a firm is over levered and at significant risk of failure. There is not nothing special about this risks for banks except that bankers, regulators, and politicians make them special. The specialness of banks is not associated with the firm, but with the banking industry and how bank risks can have negative externalities. This externalities can be controlled. Their argument is very straightforward and well=developed through the simple analogy of home ownership. If you have too little equity when you borrow to buy an asset, you will have too much risk. The return is great when you sell if the house increases in value but if the price of the home decreases, the equity can be destroyed very quickly. If the equity capital is less than 10% of the assets, the risk of failure is huge. If there risk turns negative, the government, that is the taxpayers, will foot the bill if there is some form of bail-out. Banks take risk and pocket the upside and stiff the taxpayer with the downside. The solution is very straightforward, require banks to hold more equity. Banks will say that the price of raising equity is high and that it will cause a reduction in lending, but the authors present strong arguments that this is not case, Equity can easily be raised through halting stock buy-backs and cutting dividends. Forget all of the extra regulation for banks. We can make this issue much simpler by just focusing on the equity level. The global financial community has done an effective job of stopping the movement for higher capital and equity bases. This is unfortunate, but clearly written books like this will get us to a better place faster than more regulation. FT reported that the Fed is thinking about overhauling its key benchmark rate - the Fed funds. It wants to form a new benchmark that includes Eurodollar rates. So let's get this straight. The Fed has manipulated the Fed funds rate so much that it has no meaning even if there is an increase in rates. There is no signalling about tightness or looseness in the fed funds market because the Fed controls most of the supply. So the logical thing to do under this central bank created problem is change the benchmark to something else that does provide signals. The Fed can then manipulate that new rate which will include dollar funds outside of the US. The reason is to prepare for the Fed exit strategy. In reality, with so much excess reserves in the system and the Fed having such a large balance sheet, the private market has no control over Fed funds. The benchmark has no meaning; therefore, the Fed has to redefine and gobble up more of the short-term rate markets. It is sometimes good to ask simple questions. How is the Fed is going to raise rates with so much excess supply of reserves? How much reserves have to be drained from the system to get rates higher? I would like to hear the mechanics of this. I understand the story that will be told, but how is this actually going to get done. And how are private markets doing to determine rates? Looks like the supply and demand for credit by players outside the government is a thing of the past. If rates do not provide any credit signal what will be the price of credit? Strong planting, good weather conditions in the Midwest, and no major crop problems has pushed corn prices down to four year lows. Farm income is going down and land prices which have been pushed to extremes will start to soften. The foundation for this decline has been building since last year, but you would not have know it from the price action this last winter. 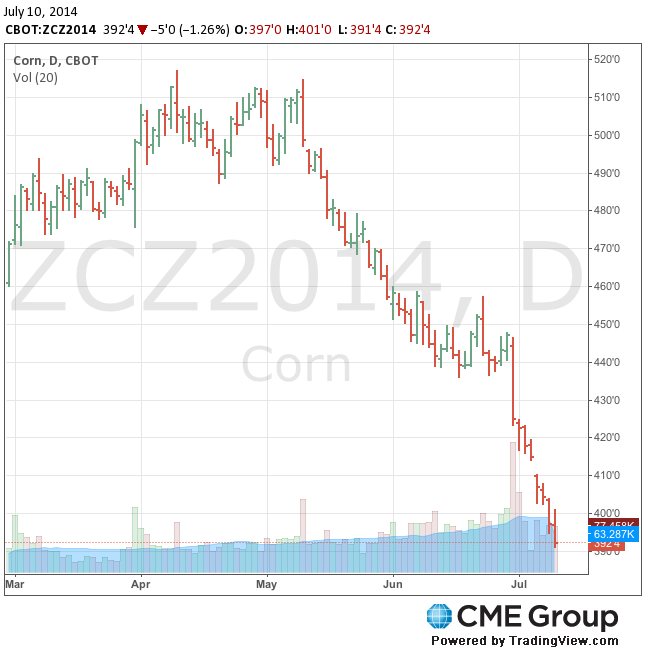 Corn is down over a dollar since spring and half the price from two years ago. Some analysts are talking about a billion metric ton harvest around the world. It is a hard argument for holding commodities at this time given agricultural moves. Do we need both sides of the brain? Nice thought piece on left and right brain thinking from Big Think. Enough with the talk about being left-brained or right-brained, we need both halves regardless of the discipline. Can you imagine being a decision-maker who only used the left half of the brain? Even a systematic trader needs the right half to be a better manager. The left brain is our analytical side, but if money management is a game against other market participants, there needs a creative component that sees the big picture. Creativity allows for new models and approaches. 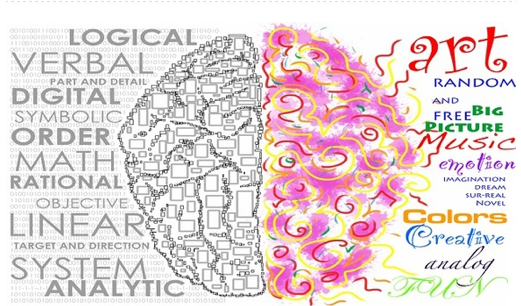 The right brain provides a mechanism to think differently. It allows for story-telling and visualization which are necessary to see through all of the numbers and spreadsheets in finance. Give me both sides of the brain. I can always use rules to control the emotions, but I need the creativity. I may have been initially fooled by the job report like the rest of the market. I have stopped looking at the unemployment number but a more careful eye is needed with all these government numbers. I was a little more skeptical given the increase in jobs just offset some of the below expected numbers earlier in the year, but you look at the headline and see that it beats expectations and you are ready to follow the crowd. It is hard to argue against following positive surprises, yet a close look at the jobs number does not show a labor market that robust. 30% of the jobs created were part-time. The number searching for work are down. Long-term unemployed is still growing. Job creation is not for the young. Workers are just dropping out of the labor market. The US is getting more like Europe which sufferers from labor market hysteresis. The long-term unemployment may not be able to come back into the workforce. Young people who do not get jobs will not gain skills. Part-time work does not provide a long-term labor solution. The problems today will create labor issues that will not be rectified with stronger growth. The theory of comparative advantage suggests that trade and globalization should be the natural state of the world. Everyone benefits with trade so it should always be undertaken, but there are other theories which get in the way of this free trade. In fact, free trade will always create winners and losers. The politics between winners and the losers is what constrains globalization. The winners have to be stronger or more powerful than the losers for the rules of the game to change. The politics of trade are driven by two major theorems or effects in trade: the Hechscher-Ohlin (HO) theorem and the Stopler -Samuelson (SS) effect. HO states that countries will export goods that more intensely uses the abundant factor and import the goods that use the scarce factor abundantly. Hence, a country that has a lot of cheap labor will export those goods that use a lot of labor. SS states that if there is an increase in the price of a good, the factor most used to produce that good will see an increase in its return. Both these theorems lead to the most important conclusion that effects the politics of trade. There will be factor price equalization over time. Cheap labor will be bid up in the country that exports labor-intensive goods, but the price of labor will decline in the country that imports the labor intensive good. The same result will occur with capital. US workers will see lower real wages or lose their jobs if the imported goods can be made with cheaper labor abroad. If you are a developed country that imports labor intensive good, domestic workers will see their real wages fall. Of course, the consumer will benefit from the cheaper goods, but the impact will be spread out over a broader base. In a slow growth environment, it is harder to push free trade policies. This issue is currently facing the US and many other developed countries and will become more important as get closer to elections. Currency and trade wars may be coming soon. This book is a nice counter to all of the negative talk about behavioral biases and poor decision-making. The premise of this work is very simple. 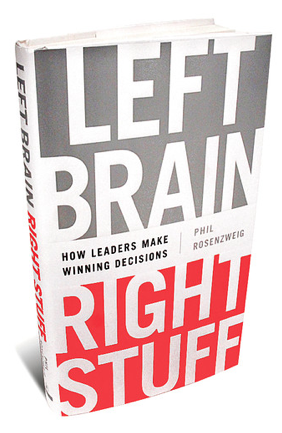 Decision-makers need to use their left brain, the analytical side to properly structure the decisions that have to be made. However, to be an effective decision-maker and manager, you need not have to use your right brain but the right stuff, the confidence to take action and make a decision. There has been so much discussion about such issues as overconfidence biases and other problems with making effective decisions that manager can be paralyzed. Rozenzweig makes the excellent point that some decisions cannot be controlled by the manager while other decisions can be and this is where the right stuff is needed. Confidence, in fact over confidence, is needed to be an effective manager and control decision-making. Think of the great golfers and athletes that need confidence to be effective. think of decision that are highly uncertain. Someone has to make a decision. In these cases, confidence is a requirement. In fact, some of the biases may just be effective ways of marking decisions under uncertainty. Think about money management. Some are great researchers but cannot make a decision. The best traders are those that combine decision framing with the confidence to take action. There is often limited information and a high degree of uncertainty. Confidence with analytics skills is necessary to make and size a trading decision. In these cases, the decision maker needs the right stuff along with framing skills. This is alternative view does not solve all issues of behavioral biases but is worth thinking about. Economics may propose, but politics dispose. Figuring out the economics of the post financial crisis is not as hard as some make it out to be. We still face a balance sheet adjustment around the globe created by excessive credit. It takes time to adjust balance sheets and there will be pain. We can delay the pain. We can soften the blow through having the workout done over a long time, but balance sheets have to be corrected. The economics are clear. The issues are more with the politics of what are possible solutions and will be tolerated by the populous. The intersection of economics and politics leads to market distortions but the markets will eventually win. Every portfolio has to be prepared for the balance sheet adjustments that cannot be controlled by politics. Michael Mandelbaum presents a spirited defense of free trade and globalization. His thesis is that globalization is irreversible and a positive force for global wealth formation. I would like to believe this story but the news of today does not seem to provide the evidence needed for a positive story. His optimism is that global war is a thing of the past and that most countries agree with the desire for wealth creation and economic growth.There is a strong propensity for free markets and technology is going to help sustain global prosperity. The road may be bumpy, but it is one that everyone in the world wants to travel on. Unfortunately, his view of the world is not much different than the conventional wisdom before World War I. In that pre-war vision, there would be no global war because the connections through trade were just too strong. The pre-WWI period was a high point in global trade that took decades to again reach after the Great War. 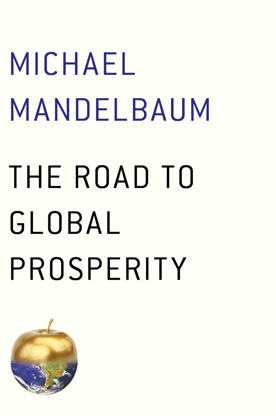 Mandelbaum's selective use of information and unfounded optimism tells a good story for globalization, but the reality seems to be much darker. A lack of cooperation across nations, an international finance system that is broken, sovereign debt problems across all continents, and regional wars from non-state players that do not seem likely to be resolved with any treaty all make for a dangerous world. The prudent man should be focusing on tail events and not try to form a world vision of what we would like but rather what we see. The Fed has a problem, what to do with the huge amount of Treasury securities on its balance sheet. We are talking about trillions and if the Fed is going to normalize policy, this inventory is going to have to come down. There has been more talk about the policy tool of reverse repos by the Fed where it will sell securities to primary dealers to control rates and adjust funding. Nice try, but the market will still know that the inventory is on the Fed balance sheet, so although it will have a tool to drain reserves it does not change the fact that its balance sheet is bloated. The shadow banking system is now the biggest users of the repo market, more so than banks. The repo has been a shrinking market since 2008 with banks being smaller players. Non-banks are bigger players because they all want to add yield. Most of this is outside the main role of the Fed. So the Fe dis going to use reverse repos as a means of controlling the shadow banking system. A strong reverse repo program would have a strong impact on the shadow banking system. First, it can set the rates to any level it wants because it has the balance sheet to do it. Second, it can set the terms of collateral at anything it wants because it has the balance sheet to do it. Some say this is a good thing because the Fed will be able to control the shadow banking system to an extent not possible before the financial crisis. Let's just say that the private markets will not be able to set short rates outside the banking system when there is a an 800 lb gorilla which want to determine macro prudential policy on the shadow rate market. So, this is a good thing? With low volatility in many markets, there has been a decline in futures and option trading volume. You can look at the trading of futures between last year and this year for the first quarter. Futures volume is off by 6%. Option volume is flat. However, there has been an increase in trading in the interest rate complex and this is an important signal. Trading volume represents differences of opinion. If everyone has the same opinion, there will be no trading. Hence, if volume is going up there is more opportunity for price discovery as buyers and sellers with different views transact. This increase in rate voluem is telling me that the market is beginning to prepare for some changes in short rate policies. Volume pick-up can be a precursor for a market move.The view is that tapering is going to lead to "normalization and it may come sooner than expected. Traders are having opinions on the market and willing to express them with trades. We just have to figure out who is right. The trading of VIX futures and options has exploded and this shows how investors are changing their views on how to hedge risk. The average volume of options on the VIX is now 700,000 contracts a day and futures trading is 186,000 contracts a day. Futures trading has increased by a factor of 10 since 2010 and options have increased by a factor of three over the same period. This explosion in growth has come while the markets have been calm and the trend direction has been lower. Trading hours has been extended and the VIX complex is the revenue and growth engine of the CBOE. The index may now be international "fear gauge" standard and we have not even seen a major spike in volatility. The new macro standard for risk hedging may be holding some VIX in a portfolio. This is a different form of hedging. 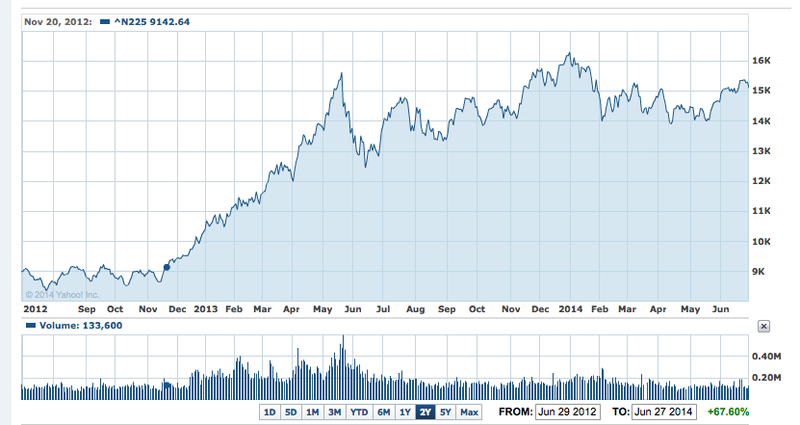 The returns in the China A shares have not been very compelling, but some changes in the fall may be worth reviewing. If you look at the China stock indices, you would be surprised to see the sideways movement. The Bank of China has been accommodating like other central banks. It may have had some fits and starts but market liquidity has been available. China growth has come down but is still at levels that would be the envy of most countries. Stock valuations are getting more attractive albeit accounting is still an issue. It is always good to go back to basics when discussing return and risk of different asset classes. Unfortunately, getting inot the details may not always be pleasant. Let's look at bonds. Volatility has been low, but if we get some greater moves in rates, bond investors may be in for a significant surprise. The duration of bonds for any given maturity have increased. The reason is simple. Coupons have declined. With more of the cash flows centered at the maturity date, there is a longer duration. Consequently there is less income cushion when we look at the total return. For all of those that think that bonds will be a safe assets, think again. The low coupons will not protect investors. Attain Capital had a good blog entry on how to profit from global weather volatility, "The climate of volatility, investing and science". 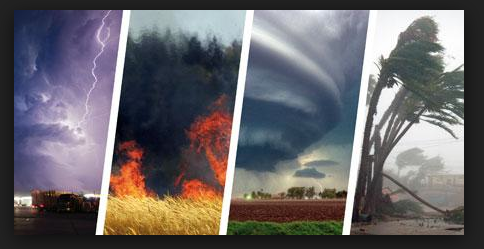 Attain concludes that the best way to exploit extreme weather is through managed futures or systematic funds. I agree, but want to add to the discussion through being more specific on why this would be the case. There are some simple reasons for why managed futures will do this better than other approaches when there is climate volatility. The arguments are straightforward. Managed futures is a long volatility strategy. Managed futures can be described as being long straddles. It makes money at extremes. Climate change expects weather extremes. More dispersion in weather patterns. Weather extremes lead to supply shocks. The extremes places stress on commodities. The latest agriculture research suggests that the response of plants to weather extremes is non-linear. Plant stress is real, so a movement to the tails in weather will generally have a bigger impact on supply than what most will expect. However, there is a second condition that is necessary for price extremes, low stocks to use. If inventory levels are low, there is no buffer stocks to smooth prices through time. Models that skew position risk to those markets which have low stocks to use will potentially do better. The risks, of course, will be greater. Market divergences is the reason why managed futures (systematic trading) has a place in the portfolio. Investors want to exploit any surprise price move, and systematic trend-following is the clearest mechanism for doing that. By its very nature a surprise will not be expected by the fundamental traders, so you need an approach that will not second guess prices. Investors also need the systematic risk management that comes with managed futures. Managed futures allows traders to exploit opportunities in a controlled manner. What is the model trying to do? What type of risk is it trying to capture? When should the model do well? Is there a good time to use this model? What was the environment when it was tested? Given to the two answers above, what was the testing environment? Did you have the perfect conditions for this model? What is the chance of success? How often does this good environment arise? The historical statistics usually associated with model performance may not provide the answer. Assessing the stats is just looking at what is above the surface. 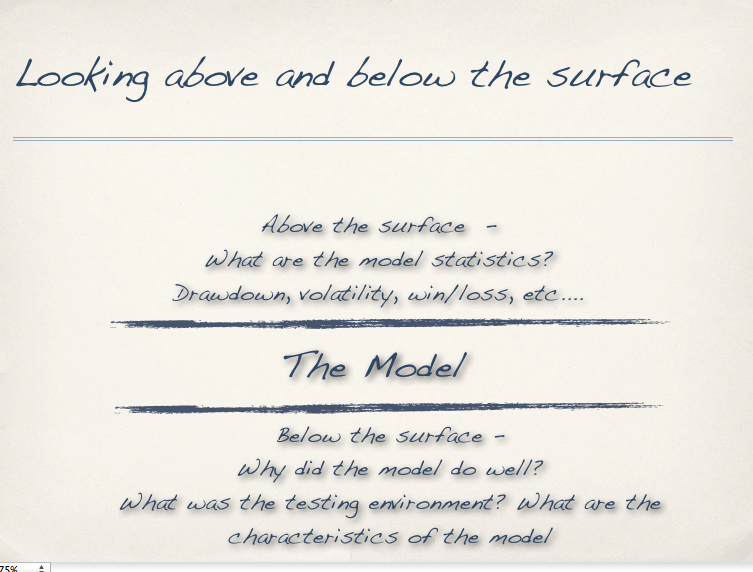 You really want to get below the surface and understand the "why" behind a model. Do you need volatility? Do you need long trends? Does it make money on market reversals? What is a reversal? A trend model tested during trending periods will do well, so what happens if there are no trends for an extended period. You do not have to predict the future, but you do have to know the comfort zone of a model. The beta for hedge funds is rising similar to what happened prior to the financial crisis. The FT reports on research from a number of sources that show hedge fund indices such as the HFRI composite at correlations anywhere from above .8 to over .9 using a three-year rolling averages. By any measure, this is high. This is what happens when there is a long slow increase in equity returns and hedge funds have lagged with performance. They will get long. They have to if they want to keep up with equity benchmarks. It is hard to say you are a "smart" manager who earns a fat fee if you underperform the S&P 500 by double digits. Now investors should not buy hedge funds and benchmark them against a volatile index, but that is the way of the world. Hedge funds are not really hedge funds. They are supposed to be high beta funds in up markets and low beta funds in down markets. The success of hedge fund managers in the next year will be if whether they can dynamically adjust their beta down when the market starts to crack. The ability of managers to adjust beta will be the true driver of skill in this market. Bonds still in range - for how long? The US bond market has been a tight range for almost a year after the taper tantrum. Interestingly as the PMI index has climbed, interest rates have actually moved lower. There is a greater chance for a break-out of this market as the mixed signals in the real economy are resolved. The focus of the optimists are on indices like the PMI which are showing positive signs. The pessimists are looking at the GDP number at -2.9 percent. The end of the big Japanese trade? The Nikkei index has seen a slight fall from its highs and the yen has reversed its trend lower. Household spending has collapsed and inflation is back. I thought the QE scheme was based on the idea that if you can get inflation higher, consumers will spend? I guess this relationship is a little more difficult to untangle when you have tax hikes, cuts in government expenditures, and an uncertain demographic future. The liquidity increase was a jolt but does not change the underlying structure. The economy needs for therapy.